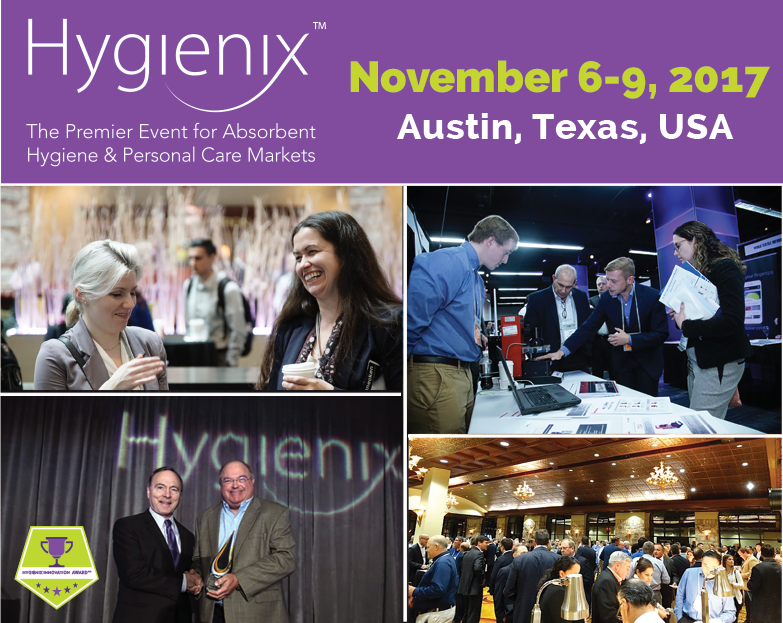 November 13, 2017 – Cary, NC – Business leaders in the absorbent hygiene and personal care industry paid rapt attention to presentations on Femcare disruptors, material innovations, and demographics at INDA’s 3rd annual HYGIENIX™ Conference last week in Austin, Texas, Nov. 6-9. The successful event drew over 530 participants from around the world and across the supply chain to advance their business in this important nonwovens and engineered materials sector. An event highlight was the presentation of INDA’s coveted Hygienix Innovation Award™ to Advanced Absorbent Technologies’ ALYNE™ Protective Underwear which manages fluid absorption in protective underwear by using multiple layers of superabsorbent polymers (SAPs) that absorb at different rates, from quick absorption to complete absorption without bulkiness.